The summer timetable can be seen here. Considering agreed flight timetable, Split Airport foresees 6 percent increase of operations and 8 percent increase of passenger numbers. A total of 51 airlines announced their flights during summer season. Five of them are new ones. Regarding new destinations, we particularly mention MSQ (Minsk), DOL (Deauville) and ANR (Antwerpen). We also point out the growth of number of flights from Scandinavia, Switzerland, Great Britain, France and Greece. It is also important to emphasize an ever increasing number of shoulder season and low season flight announcements. Split Airport, SPU (LDSP), is a Schedules Facilitated Airport (00:01 h - 24:00 h ) for the summer season from 27 MAR 16 until 29 OCT 16. AIRAC AIP AMDT 0037216 WEF 28APR2016 states changes of Instrument Approach Procedures for Split Airport (LDSP). These changes are given in TRIGGER NOTAM A0667/16. The document may be seen here. After last year problems, olive trees have gratified us with abundant yield this year. Sunny and calm weather at the end of last week helped us pick 12.123 kg of olives in three days. 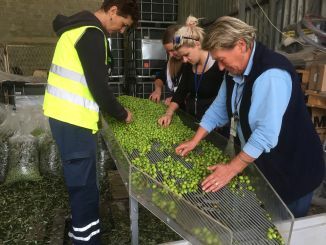 They were immediately processed into 1.265 litres of high quality olive oil.